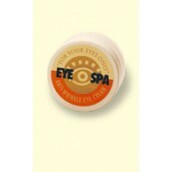 Our Eye Spa cream glides easily on delicate skin and contains shea butter, aloe vera, and other skin..
Disclaimer: *Name trademarks and copyrights are properties of their respective manufacturers and/or designers. The Epiphany Perfume Co. has no affiliation with the manufacturers/designers. Our interpretation of these fragrances was created through chemical analysis and reproduction, and the purpose of this description is to give the customer an idea of scent character, not to mislead or confuse the customer. It is not intended to infringe on the manufacturers/designer's name and valuable trademark. We do not represent our products to be original nor do we represent that they are exact copies; therefore they do not violate any copyright laws. Any references to brand names are made strictly for comparison. Also, let it be known, that this web site has no affiliation to, and is not associated or sponsored by any of these trademark owners. We simply ask the consumer to compare the price, style, and quality of the designer brand products to The Epiphany Perfume Co. products. These are The Epiphany Perfume Co. products NOT original perfumes, colognes or scented products.